My asawa and I were in the office of “Sony,” the “in-charge” person at our Land Transportation Office, LTO, in Guimaras. We wanted to renew the vehicle registration on our Ford Ranger. We had already taken our truck to a local emissions testing center on our island province. The “smoke test” operator informed us that the test results couldn’t be loaded into their computer. Why? The LTO database didn’t have our license plate number in their system. 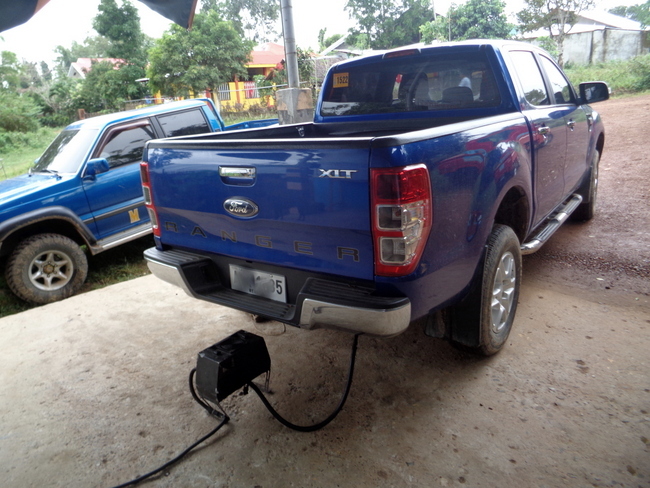 It seems that our Ford dealership in Iloilo City did not have our new license plate number loaded into the LTO system. That’s what “Sony” told us. However, since we didn’t need to renew our new vehicle’s registration for three years, we didn’t know we had a problem until now. However, we were hopeful that our local LTO Director could get our license plate number into their system through her contacts in Iloilo City. If not, we would have to make a trip to the main LTO facility in Jaro. We were one of the lucky ones. It only took a few months for us to receive the new license plates for our Ford Ranger. There are people that have waiting for over a year for their plates. However, the Iloilo Ford dealership used a “temporary” license number on the form they registered with LTO. When the plates were issued to us, the new license plate number was never put into the LTO database, causing the problem we have today. Nevertheless, Sony told us she would text her contacts in Iloilo City and attempt to have our license plate number loaded. The helpful Director took my wife’s contact information and informed us she would let us know the results of her efforts. We thanked Sony for her invaluable assistance. Anything that could save us a trip to the main Land Transportation Office in Iloilo was extremely good news to me. Moreover, Sony informed me that I could renew my Philippine Driver’s License in the Guimaras office now. Three years ago, I had to visit the main office in Iloilo to obtain my license. However, the Guimaras LTO is now a full-service facility. I wouldn’t have to go to Iloilo. I was happier than a turd in a toilet bowl. The next day we received a text from Sony. Our license plate number was successfully loaded! The helpful LTO head would keep us updated and let us know if our registration would end this February or this coming May; the next step in the process to renew our vehicle registration in the Philippines. If our renewal came up in May, we wouldn’t have to have the emissions test again. So a BIG THANKS to Ms. Sony at the Guimaras Land Transportation Office. Her assistance is sincerely appreciated. ← LTO Lifesaver Rescues American Expat?